The SUN represents God, the driving force behind Bloomfield Academy, the source of its guidance and its ultimate head. The FLOWER represents the Bloomfield Student, who grows in the grace of God with the guidance his teachers and parents. The twin LEAVES stand for the partnership between the home and the school in the development of the child. The STEM holding up the entire flower represents the school's Philosophy, Vision, and Mission which is the foundation of the entire school. The STRIPED PORTION represents the levels of development that one must undergo to achieve optimum mastery of his potentials. 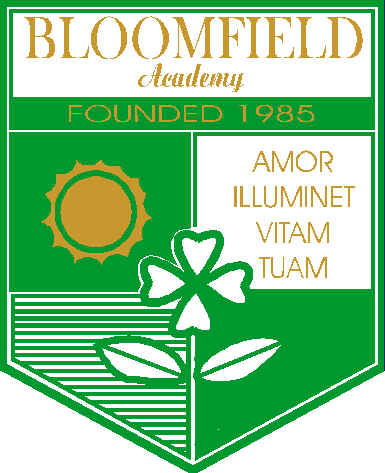 The GREEN PORTION represents the school, the field on which the flower grows and reaches full bloom, hence the school's name, Bloomfield. The school motto, Amor Illuminet Vitam Tuam or Let Love Light Your Life is placed oppposite the sun, declaring the school's most basic philosophy.